Not counting wisdom teeth, the average person age 20-39 is missing one tooth, the average 40-49-year old is missing 3.5 teeth, and those aged over 60 are missing 8 teeth– and this is usually because of gum disease. September is National Gum Care Month, which is relevant in a country in which 47.2% (or 67 million Americans) suffer gum disease, to varying degrees. Most people go to their dentists for the annual check up and still don’t get this addressed. We hope that this September, you will take a bit of time to check on the health of your family so you can avoid experiencing the unpleasant consequences of this unseen epidemic. Gingivitis and periodontitis are two forms of gum disease, both of which are caused by bacterial infection in your gums. 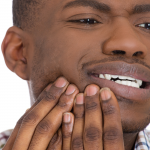 Gingivitis is a mild form of the disease that causes gum pain and bleeding. If left untreated, it can advance to its more dangerous form, periodontitis. Why does it matter? The #1 reason for us is that periodontitis is the most common cause of teeth falling out. Not counting wisdom teeth, the average person age 20-39 is missing one tooth, the average 40-49-year old is missing 3.5 teeth, and those aged over 60 are missing 8 teeth– and this is usually because of gum disease. If you have any–ANY gum bleeding; if you notice mouth sores, gum pain, and/or a sour taste in your mouth, it´s time to go to the dentist. Prompt dental treatment can keep gingivitis from progressing into periodontitis and its associated problems down the road. Periodontitis is more serious than it may first appear, and it comes in different forms. It can appear as aggressive periodontitis, which is a rapid gum recession that often occurs during a period of growth in young people due to vitamin depletion (not bacteria). 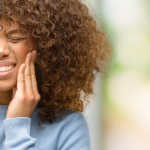 Chronic periodontitis has a trajectory in which a person may go through periods of rapid progression and then periods of remission–which could happen on its own or in response to dental intervention. The issue of periodontitis is important not only for cosmetic reasons—(people who have healthy teeth tend to look young for longer)—nor only for functional ones (it´s easier and less costly to retain all your own teeth). Gum disease is also a systemic disease that is related to the body’s reaction to bacteria, and thus can have far-reaching effects on your overall health. Treating periodontal disease helps protect you against other systemic inflammatory conditions, such as diabetes, heart disease, and autoimmune conditions. Gum disease can be prevented largely through personal dental hygiene and a good diet. 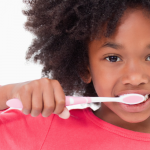 Dental hygiene requires at brushing and flossing thoroughly at least once a day. 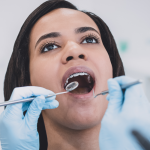 If you have had a history of gingivitis or periodontitis, your dentist may recommend that you buy additional instruments to clean bacteria off your teeth and tongue more effectively. If you’ve noticed your gums bleeding, that means that your mouth is not healthy. Continue flossing for a week and see how it goes. Note: It is not necessary to press down hard on the gums; just pass the floss lightly down your teeth, rubbing the side of each tooth all the way to the gum to ensure that you pick up plaque and stray bacteria. If your gums are still bleeding after daily flossing, then it is safe to assume that your gums are sick. Schedule an appointment with your dentist and request measures to help control it (stop bleeding, receding gums, bone loss, etc). It is also important to identify the bad bacteria that are causing this problem and stabilize them as well. To do this, your dentist would have to do a lab test to analyze your saliva because these bacteria cannot be perceived by the naked eye. When almost half of Americans suffer some form of gum disease, why wait? This September, you can observe National Gum Care Month with a trip to the dentist to put all your worries at rest. If you have children, take the occasion to review their dental care routines and emphasize the importance of daily tooth care. A clean mouth can´t get sick! Penn Dental Medicine offers high quality dental care to individuals and families, providing an array of dental services and specialties. As part of our mission as a dental school, we transfer deep dental discounts to our patients to ensure access to our services. Please get in touch with us today to get your first appointment, and be sure to use this $25 off first visit coupon!